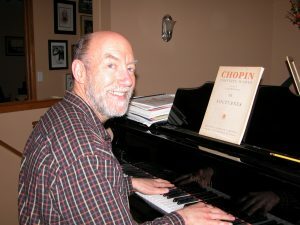 John Gordon’s musical background ranges from marching band piccolo and big band saxophone to classical choir bass and ragtime piano. He was the first to obtain a Ph.D. in computer music. His main interest is composition, which he has been pursuing for over thirty years. Lately he has been focusing on writing new hymns and church solos. John’s style is firmly based on the classics and yet draws on many diverse influences such as Bach, Chopin, and contemporary artists. He lives in Bellingham, Washington. John Gordon's sensitively lyrical words and settings are as satisfying to sing as they are to hear. The quality of his compositions will stand the test of time, and add works of lasting value to sacred solo repertoire.